Vinyl LP's. Cleaning, care and maintenance. Loudspeaker Impedance. Does it matter? A Buyer's Guide. Record decks. A guide to turntable set-up. A concise guide to valve power amplifiers. 4-channel vinyl reproduction 70's style. It's not quite what one would expect from a website which specializes in Classic Audio – enthusiasm and promotion of a product that, far from being vintage, has yet to be officially launched! But what if this balanced power supply has an unquestionably highly positive effect on the performance of all audio equipment, regardless of vintage? This isn't something that can make a poor performing system, for whatever reason, sound good. Can anything? What I've discovered is that it will make a monumental improvement to a well-balanced/high-end system – an improvement that you simply could not have imagined possible without replacing most of the current line-up of gear. Now, that's quite a claim! The unit I have talked-up so much is an AC Balanced Power Supply, specifically designed for audio use and manufactured by Z-Axis Audio- a company based in West Sussex, England. 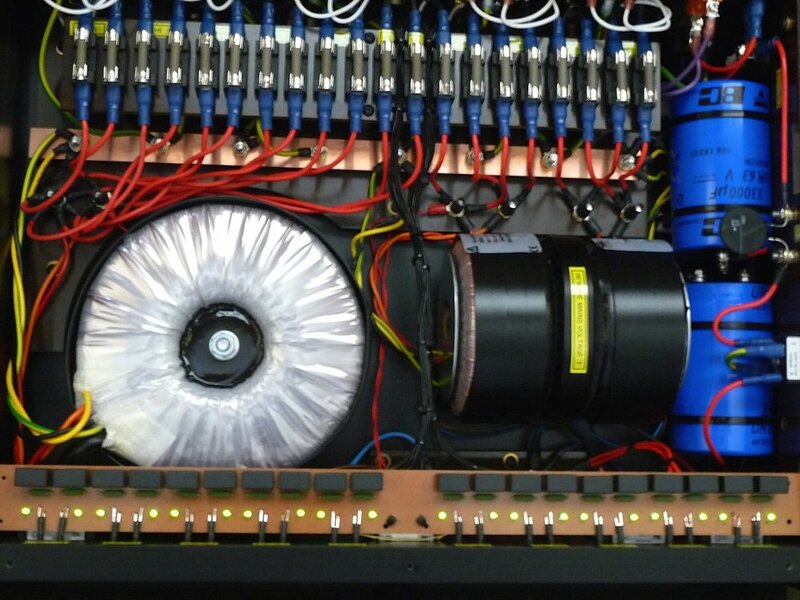 The case is about the size of a medium-sized power amplifier, and weighs about the same (29Kg). The circuit design is in three-sections, housed within the precision-machined aluminium chassis. 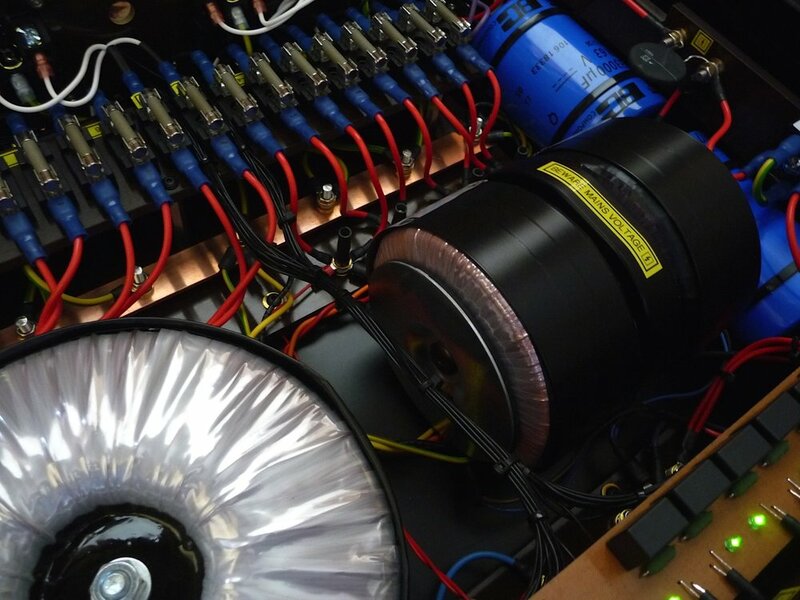 Internally, there are three custom-made toroidal transformers and a quality DC filter section utilizing Vishay capacitors. 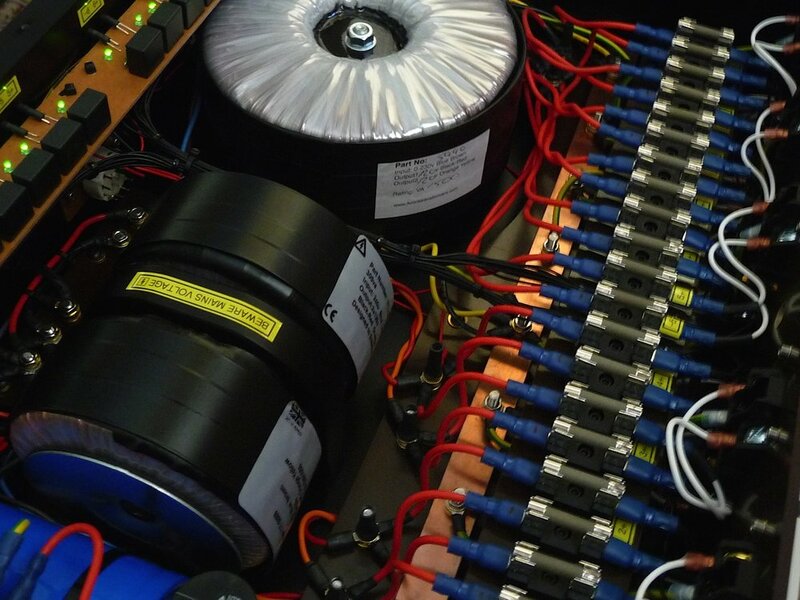 The largest of the three toroidal transformers is intended for use by analogue pre and power amplifier(s), and is a sizeable 1.5 Kva which can be supplied up to 3 Kva, depending on the amplifier mains power requirement. On the rear panel are ten high quality Furutech mains outlets. These must provide the power requirement for the entire audio system. In order for the unit to work effectively, no equipment connected to the system in any way should be powered by any other external power supply. Each mains outlet on the Symetrica Balanced Power Supply is comprehensively fused with either 6 amp 0r 3 amp slow-blow, non-resonant ceramic fuses across both terminals. Digital indications on the front panel display the incoming mains voltage and that of the balanced mains power lines which feed the output sockets. There are also three red displays for the current output of each output section/transformer circuit. On the front top edge are a row of green LED's visible through the top cover, indicating the status of each of the output sockets - an LED for each live rail. An unlit LED indicates a fuse failure. A solid copper, low impedance earth bus bar connects all the earthing points to the single entry point. The Symetrica internal wiring utilizes high quality copper silver-plated, stranded and Teflon insulated wire. Only high pressure, cold weld (crimp) connections are employed using copper connections throughout. What is a Balanced Power Supply? Much like balanced cabling and equipment used in a professional recording studio, similar technology is extended to the balanced mains power supplied by the Symetrica for home audio equipment. In audio use, balanced cabling and circuitry is used to largely eliminate noise induced into lengthy runs of wire, for example between a microphone and the input of a mixing desk. If conventional audio cabling were used, such as that in a typical Hi-Fi system (single-ended as opposed to balanced), the noise induced in the long run of cable would virtually overwhelm the actual microphone signal. This induced noise is typically, but not exclusively, Radio Frequency Induction Interference or RFI, partly caused by the myriad of radio frequency interference present in the atmosphere, but especially concentrated in a recording studio environment. However, this same interference is also caused by AC powered equipment of all kinds, not just audio equipment but by switch-mode power supplies such as phone chargers. Computers, TV's, hairdryers, washing machines are all culprits too, as is virtually any electrical device that doesn't just present pure resistance to the mains, such as a light bulb. The mains supply to your audio equipment is likewise subject to the same interference, not just atmosphere-borne, but also noise dumped directly into the household mains and earthing circuits by the type of appliances mentioned above. And this interference doesn't have to originate from within your own house or flat, but could be coming from many Mr and Mrs Gizmophiles living streets away in the locality. Just to complicate matters further, your audio signal can also be degraded by unwanted RFI generated within the audio component itself, in addition to other audio units located nearby. Unfortunately, the usual approach of shield and chassis earthing to ground is insufficient to deal with the problem. You may not actually hear hum or obvious interference on the output, but it can markedly affect the quality of the audio signal. Earthing remains something of a Black Art, and problems are worsened further where the electrical earth and signal earth are not kept entirely separate. In the case of the Symetrica Balanced Power Supply, as is the approach sometimes used for balancing audio circuits, transformers are utilized to achieve the balanced power lines. No voltage or current is left on the ground reference, including any unwanted transient voltages and reactive currents, which would normally be on the neutral and ground wires. This is a balanced power circuit which would apply to the USA. In the UK, the overall voltage is 240 volts and each power line carries 120 volts as opposed to 60 volts. Note how the reactive elements, the unwanted interference is cancelled out within the transformer. The three transformers in the Symetrica allow for amplifiers (pre and power), analogue sources and digital sources to be powered from three different supplies. Electrical earthing and mains “neutral” are kept entirely separate, ensuring there is no "contamination" by one to the other. With this AC balanced power system, the “neutral” and “live” power lines are not differentiated. The 240 volts AC is achieved by providing a potential difference of 120 volts on each power line (which is out of phase with respect to the other), relative to the “zero” centre tap of the transformer. Equipment is not adversely affected by this arrangement in any way, as an overall 240 volts AC at 50 Hz is still available. Neither is there any need for a “floating earth”, or other such unsafe approach necessary to achieve the balanced power supply and a “clean” earth. Operation of the Symetrica Power Supply is as straight forward as it could be. It can economically be left connected to the mains 24/7, as power consumption by the unit itself, which runs slightly warm to the touch, is absolutely minimal. The front panel displays can be switched off entirely. As the mains supply to all the components in a complete system would be balanced, there is less requirement for exotic and expensive shielded mains cables. The sound of the Symetrica Balanced Power Supply. I'm disinclined to list arbitrary tracks which I can now hear with renewed degrees of "slam", and other such meaningless descriptions. What I will say is that, if you already own a good audio system, don't contemplate an upgrade of a single component without first auditioning this unit in circuit. The impact of having the Symetrica in a system is immediate and obvious from the first few notes. There's absolutely no need to engage in careful A-B comparisons. The sound-stage is immediately hugely widened and the speaker location becomes hidden. There's no sense of compression or restriction to dynamics, as is so often the case with some conventional mains conditioning devices. You will have the feeling that the system is working at its optimum level such as never before. The low frequencies are deep and controlled, high's more detailed, smoother and seem to soar away. The results obtained with digital sources are particularly spectacular. For the first time, I was not confident of identifying and preferring a very high quality analogue source when compared to the digital equivalent. The CD player in use took on a previously unheard smoothness with an enormous sound-stage, coupled with the most tremendous bass response. Apparently, this is partly attributable to jitter being significantly reduced by 50-60% when a balanced power supply is in use. By necessity, the Symetrica is not cheap as quality materials and precision engineering are employed throughout, and each unit is hand assembled. The unit cannot be classed as a mains conditioner as DC filtering is a just a very small part of its total function. Neither is it subject to the hit-and-miss results obtained with mains conditioning devices, even regenerative ones. The Symetrica approach allows audio equipment to work as it should, and yields consistently amazing results. The price is expected to be in the region of £6500 and units should be available for sale later this summer. For more information on the Symetrica, contact Z-Axis Audio or myself George, at mysonicspace. Symetrica is a 3 section ‘balanced’ or ‘symmetrical’ output power supply for high end audio system use. Connection is with a single mains supply input via a Neutrik 32amp Powercon locking connection. A very low electrical impedance power cable is supplied using a Furutech 1363G (gold plated alpha pure copper) mains plug (UK). 1 x 1.5 or 2Kva circuit transformer for all gain (amplifier) sections; Power amplifiers, pre-amplifiers, phono stages*, powered loudspeakers, subwoofers etc. Maximum current is 6.8 amps for the 1.5Kva or 8.8 amps for the 2Kva. (at 240v). Optional 2.5Kva or 3Kva main transformer (requires deeper casework) for all gain stages, as per above. * Phono amplifiers benefit being powered from the 2nd 300va transformer (sockets 3 & 4 or 4, 5 & 6 depending on configuration specified at point of order). 1 x 300Va circuit transformer for all analogue source equipment, i.e., Phono amplifier, tuner, turntable etc, powering 2 or 3 (depending on configuration) of the output sockets. Maximum current of 1.1 amps (at 240v). Substantial DC filter section features 2 x 16,500uf Vishay anti parallel capacitors (33K uf each) and 35amp parallel bypass/overload Vishay bridge rectifier. Incoming voltage display, switchable to indicate voltage output of the secondary stages. Three current output displays (red), one for each output section / transformer circuit. Voltage and current displays can be switched off by a rear mounted switch. Output fuse status display LED’s in green, indicating status of all live pins at the output sockets. These indicators remain on even when the voltage and current indicators are switched off. All internal circuit boards are made from either 6mm Tufnol or 2mm Tufnol for the LED fuse status display circuit, which is point to point wired. Ten Furutech gold plated UK 3 pin outlet sockets. Both live pins are fused with either 6 amp or 3 amp (depending on use) Eaton Bussman 32mm x 6.35 slow blow, non-resonant fuses. These sockets are by far the best available with excellent physical grip of the mains plug. Primary input fuse 12 amp slow blow 32 x 6.35mm Eaton Bussman non resonant, ceramic fuse. Solid copper low impedance earthing bus bar connecting all earth points to a single entry point. All internal wiring with high quality pure copper, silver plated, stranded and Teflon insulated wire. All wiring is of high pressure, cold weld (crimp) construction using copper connections. No soldered joints. On - Off mains switch on rear of unit. Non magnetic casework from Valchromat and anodised aluminium. 4mm thick rear panel for added strength (aluminium). Anodised aluminium side fins for heat dissipation. Optional tinted or dark acrylic top cover panel. Dark grey 6 mm glass front face-plate. Configuration A: Sockets 1 and 2 are fed by 1 x 300va balanced transformer - used to connect all digital equipment. Sockets 3 and 4 are fed by the 2nd 300va balanced transformer - used to connect analogue source components, including the phono amplifier. Sockets 5-10 are fed by the 1.5 - 2Kva balanced output transformer- used to connect the main gain stages, i.e., power amplifiers/s, pre-amplifiers and sub-woofers, powered loudspeakers, integrated amplifiers, etc. Configuration B: Sockets 1, 2 and 3 are fed by 1 x 300va balanced transformer, and - used to connect all digital equipment. Sockets 4, 5 and 6 are fed by the 2nd 300va balanced transformer - used to connect analogue source components including the phono amplifier. Sockets 7-10 are fed by the 1.5 - 2Kva balanced output transformer - used to connect the main gain stages, i.e., power amplifiers/s, pre-amplifiers, subwoofers, powered loudspeakers, integrated amplifiers, etc. Other custom configuration are available at the time of ordering. Please contact Z-Axis Audio for more details. Classic audio products to entice. Sales of distinctive, pristine classic audio.